Geraniums are so ubiquitous in summer pots that they need no introduction. They are well-known for their fuzzy, uniquely-scented leaves and large clusters of flowers in brilliant red and other eye-catching colors. The showy, flowering geraniums normally sold as bedding plants are members of the genus Pelargonium. These subtropical perennials are treated as annuals. The most commonly grown types, called zonal geraniums often have distinct leaf markings. Flower colors range from deep burgundy to red and pink to salmon and white. They may be single- or double-petaled. Geraniums don't ask for much. Just give them full sun or partial shade and moderate amounts of water. Pinch blooms as they fade to keep them from becoming moldy and to encourage new blooms. These annuals are seldom bothered by inscts and diseases. Aphids and whiteflies are occasional pests. If necessary, treat them with insecticidal soap. Edema-raised brown patches on the undersides of leaves-may result from overwatering. If mold or stem rot is a problem, increase air circulation around the plants. This is one annual that can withstand some cold. It's among the hardiest of annuals and is one of the last flowers to freeze in the fall. You don't have to say goodbye to your Pelargoniums with the first hard frost. They can be wintered indoors by growing them as houseplants, taking cuttings, or storing bare-root plants in a cool, dry place. Be sure to bring plants in from the garden prior to the first frost. It's easy to reproduce your favorite plants by cuttings. Snip off a few stem sections about 6 inches long and remove the lower leaves. Dip cuttings in rooting hormone and insert the cut end into damp perlite or sand. Do not cover cuttings in plastic; they need good air circulation or they will rot. Ivy geraniums have ivy-like leaves and creep and trail like an ivy. They are perfect for hanging baskets, window boxes, and balcony plantings. Plants produce round clusters of individual florets with well-spaced, narrow petals. Colors range from shades of pink and purple to red and white. Though quite drought-tolerant, ivy types are less heat resistant than zonal geraniums. They do best with some protection from the hot afternoon sun. Water and fertilize regularly for better blooming. Ivy geraniums mix nicely with other annuals such as lobelia, diascia, and petunias. Combine them with bold, upright partners such as cannas or ornamental grasses. Scented geraniums are also fun to grow. These plants have white or pink flowers that aren't very showy. But their claim to fame is their aromatic leaves, which come in a variety of fragrances including lemon, rose, apple, coconut, and nutmeg. Many have deeply lobed, soft-textured leaves, often in shades of grey-green. Scented Pelargoniums are perfect in herb gardens and along paths. They can also be grown indoors, trained into topiaries, and used to make herbal tea. Mosquito, or citronella plants were developed by introducing a gene from citronella grass into a scented Pelargonium species. 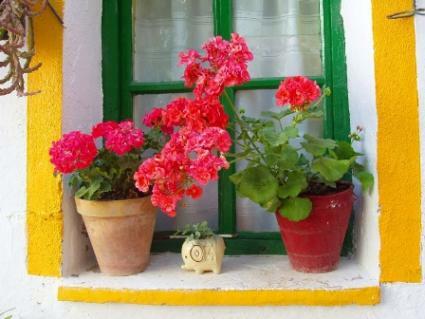 When rubbed or crushed, these geraniums release the citronella oil, which helps repel mosquitoes. Pelargoniums offer a wide variety of flower colors and leaf shapes. You can create a strikingly varied display using geraniums alone. Many varieties with less showy flowers make up for it with their attractive foliage. 'Frank Headly' shines with a creamy variegated leaf sets off single, salmon flowers. 'Vancouver Centennial' has small, dark, maple-shaped leaves with chartreuse margins. 'Black Velvet Rose' contrasts unusual black leaves with thin green margins and bright rose florets. The new 'Black Velvet Scarlet' boasts the same leaves with flashy scarlet blooms. For a traditional red geranium with a twist, try 'Contrast', which has green, cream, and red foliage. Regal or Martha Washington geraniums are not as heat tolerant as others and are often sold as indoor plants. They are noted for their large flowers, attractive foliage and extended flowering time.